We’d love your help. Let us know what’s wrong with this preview of The Secret Birthday Message by Eric Carle. To ask other readers questions about The Secret Birthday Message, please sign up. Loved it! Great for young children for learning shapes and as they’re reading/listening to solve a puzzle to find a (very wonderful) birthday gift. The illustrations are wonderful. Vibrant colors! Great cut outs on the pages. The shapes are unusual for a shapes book and they’re interesting and pertinent to the story/puzzle. This book is a lot of fun. Some young kids will spend a good deal of time with this one. One could reasonably say Eric Carle's work is the professional opera of the children's book world: stories that usually don't proceed in linear fashion, but with stunning visuals and lavish production values. The esteemed author-illustrator of The Very Hungry Caterpillar, The Grouchy Ladybug, and Hello, Red Fox has created another picture book of operatic proportions in The Secret Birthday Message, an innovative piece comparable to the offerings of Simms Taback and Laura Vaccaro Seeger. Pages o One could reasonably say Eric Carle's work is the professional opera of the children's book world: stories that usually don't proceed in linear fashion, but with stunning visuals and lavish production values. The esteemed author-illustrator of The Very Hungry Caterpillar, The Grouchy Ladybug, and Hello, Red Fox has created another picture book of operatic proportions in The Secret Birthday Message, an innovative piece comparable to the offerings of Simms Taback and Laura Vaccaro Seeger. Pages of drastically differing shape and size harmoniously layer one atop the next as the story progresses toward its final reveal. The night before Tim's birthday, he finds a note and coded instructions waiting on his bed. His present can be found by following a series of clues that take him out into the deep, dark night, through a bat-filled cave, down an underground walkway, and finally to the location of his birthday gift. What a memorable search it is, with a nice payoff at the end when we discover what Tim is getting for his birthday. If only all birthdays could be so much fun; and for the reader, they can be, with each new expedition through this book. Just open it back to page one anytime you're in the mood for a mini adventure. I really love Eric Carle but somehow never read this one! The art is beautiful, I like the story and the ending is cute. But I don’t love the die-cut pages that are awkward to turn. It’s just disruptive to the story and especially the “rock page” just flips open on its own. It’s a neat idea but I don’t like how it actually functions. I love the really bright colors on the front cover - especially the pink house against the blue sky. This picture book is super fun for kids, they get to guess what the symbols and shapes mean and what the birthday surprise is! This story is great for early elementary and is a good way to have kids name shapes and symbols while also reading the story. The story is very cohesive and smooth, the pictures are so much fun and interactive as each page is a different shape or symbol relating to the story, so readers feel like they are following the directions in the birthday note. Filled with die-cut illustrations, this interactive book was a huge hit. Young independent readers will love using their knowledge of shapes to unravel the secret message. It's one of those books that will get read many times. Eric Carle hits another homerun with this simple story that uses clues to solve a puzzle. Shapes are used cleverly to reveal where the birthday message has been hidden. Each page reveals the next part of the puzzle ending with a sweet puppy. This one is fun for young elementary age kids to solve the puzzle alongside Tim as he decodes his birthday message. Typical amazing Carle illustrations with some die cut pages. Eric Carle has such a unique way of delivering a story. This book is no exception. It's not only about the story, but how to reach the end of the story. A very fun book with a type of treasure hunt. Great use of shapes and creative page cut outs. Excellent for children of all ages. This review has been hidden because it contains spoilers. To view it, click here. A fun read, but that picture of the puppy is all kinds of creepy. That was a very extiting book. Ilove it . This was cute. I liked the specially cut pages. I was surprised how well it had held up until I saw that it's only ever been checked out twice. Cute holes and shapes cut in the paper. Love the interactive quality of this book! When I found this book from the library, the pink house in the middle of the front cover caught my eyes right away. A dark pink house standing in the dark night while there are so many starts in the background. I could see a boy is reading a letter with smile on his face. When I looked up to tittle, the font of the tittle is straight and black . A secret message, and the boy is smiling. This made me want to open the book and find out what is going on. The book is about a boy who named Tim. Tim f When I found this book from the library, the pink house in the middle of the front cover caught my eyes right away. A dark pink house standing in the dark night while there are so many starts in the background. I could see a boy is reading a letter with smile on his face. When I looked up to tittle, the font of the tittle is straight and black . A secret message, and the boy is smiling. This made me want to open the book and find out what is going on. The book is about a boy who named Tim. Tim found a anyounms letter under his pillow before his birthday. That is a letter was written with shapes and few words. Tim need to be on a treasure hunt in case to find the birthday gift that the writer prepared for him. At first I was confused about he writing style of the author. "When the 'semi-circle' comes up" What is the semi-circle and why would it come up? If you continue reading you will found out on the next page there is a big semi-circle has been cut off of the page. It is a moon! So the star shape is represent the star on the sky. It was really fun to read the book because there are different cut offs on each pages. Most of the illustrations are counterpoint so you would have to read the text while "discovering" the story with illustrations. This book is about a boy who receives a secret birthday message the night before his birthday. He has to decode the secret message to lead him to his birthday gift. The illustration are bright and fun and the book is designed to be interactive with the secret birthday message. I gave this book 5 stars because it was really fun to read. I was trying to guess what all the symbols stood for in the secret message. The author guides you through the message with pictures and other features until the en This book is about a boy who receives a secret birthday message the night before his birthday. He has to decode the secret message to lead him to his birthday gift. The illustration are bright and fun and the book is designed to be interactive with the secret birthday message. I gave this book 5 stars because it was really fun to read. I was trying to guess what all the symbols stood for in the secret message. The author guides you through the message with pictures and other features until the end where you find the birthday gift. At there end there is also a map of the course that you had to take to get there. This reminded me of when I would younger and making up code names and a different language with my friends so our parents or teachers did not know what we were talking about. The symbols of the secret message reminded me of Egyptian hieroglyphics. Although we did not go into extensive lessons about Egypt until 6th grade. If it is talked about in younger grades students could learn the symbols for words they do know like cat, house, mom, chair, table, etc. and try to form sentence with them. Students can write the sentences in English and then find the matching hieroglyphic for each word. They will be working on sentence structure and learning about Egyptian culture. This review has been hidden because it contains spoilers. To view it, click here. This children's book was written for Tim's birthday but students can learn more about shapes and directions through this book. The night before his own birthday, Tim finds a secret message directing him to his birthday gift and he is on the hunt to find it. The direction is given in sentences and shapes for him to figure out himself. The pages are shaped differently to show how it must have been to be in Tim's shoes. As a teacher, I would use this text in the classroom to review shapes. Students This children's book was written for Tim's birthday but students can learn more about shapes and directions through this book. The night before his own birthday, Tim finds a secret message directing him to his birthday gift and he is on the hunt to find it. The direction is given in sentences and shapes for him to figure out himself. The pages are shaped differently to show how it must have been to be in Tim's shoes. As a teacher, I would use this text in the classroom to review shapes. Students can fill in the blank of each shape as I read the story aloud to see if they know their shapes. This book is adventurous and fun so I'm sure all students will enjoy reading this book and they can also create their own secret messages to each other! This book was really good because it has a theme, of adventure and it's a fun read. The book has sentences with key words that are pictures rather than the actual word. This makes the book more fun for students because they try to figure it out. The pages are also different sizes and cuts. They are not your traditional rectangular page. They are different in terms of the word. In the book, it is Tim's birthday. He gets the coded message telling him to go to certain places so that he can find his This book was really good because it has a theme, of adventure and it's a fun read. The book has sentences with key words that are pictures rather than the actual word. This makes the book more fun for students because they try to figure it out. The pages are also different sizes and cuts. They are not your traditional rectangular page. They are different in terms of the word. In the book, it is Tim's birthday. He gets the coded message telling him to go to certain places so that he can find his gift. It is a treasure hunt. Tim has to go "under" and "through" a lot of different things. I think this book is perfect for teaching prepositions. I also think at the end of the book the student can practice using their prepositions by creating their own coded message. Brief review- This book is about a kid who gets a secret message on his birthday. Its a mystery think that this book would be hard for a read aloud because you have to understand exactly what the shapes mean. I think this would be a good partner read because they could help each other figure out the secret message. This book is also great to read this for a students birthday. Content area- The content area this could be used in is math. The author uses a lot of shapes in the secret message so yo Brief review- This book is about a kid who gets a secret message on his birthday. Its a mystery think that this book would be hard for a read aloud because you have to understand exactly what the shapes mean. I think this would be a good partner read because they could help each other figure out the secret message. This book is also great to read this for a students birthday. Content area- The content area this could be used in is math. The author uses a lot of shapes in the secret message so you could have the kids name talk about and make their own secret message with shapes. Then draw the picture to match they're letter. 1. What does this shape ● represent in the story? a. It represents a round opening that needs to be crawled through. 2. What type of math is represented in this story? how? Geometry because the shapes in the secret message and in geometry. Why did he uses shapes in the letter? 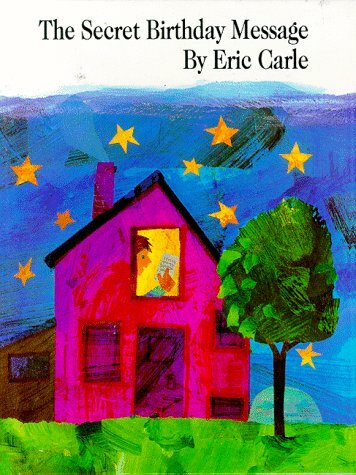 I loved Eric Carl books when I was growing up so whenever I find fun Eric Carl books at the library, I pick them up. In honor of my daugther's birthday this weekend, I grabbed this one! It didn't have much of a plot. What I usually love about Eric Carl books is of course the illustrations. This still had the unique illustrations, but it lacked content. I love that most of his books educate you. One of my favorites is Mister Seahorse and the Very Quiet Cricket. But I liked the shapes in this one. H I loved Eric Carl books when I was growing up so whenever I find fun Eric Carl books at the library, I pick them up. In honor of my daugther's birthday this weekend, I grabbed this one! But I liked the shapes in this one. How it showed how ordinary things in life are all made out of different shapes. So this was nice to reinforce some of the shapes my daughter has been learning -- and of course the little kid was solving a mystery to get his birthday present! A boy went on a "mysterious" journey; in the end, he was surprised by a birthday gift. The book is engaging and playful, which creates 3D experiences for young readers. They can peek through many shapes as they read the book. Those shapes mostly come from children's daily lives--sunrise (half circle), staircase (multiple rectangles and a trapezoid), stars, etc. ; they are natural, irregular shapes, unlike the typical "perfect" triangles, squares, and circles found in classroom learning. This book A boy went on a "mysterious" journey; in the end, he was surprised by a birthday gift. On the night before Tim’s birthday he finds a strange and secret message full of cryptic shapes. The message tells him to follow the directions in the letter to find his birthday present. Each of the successive pages features a line of the message that takes Tim closer to his present. Carle uses his signature illustration style along with layered pages to create an intriguing mystery. The final page shows a map of the route Tim takes. I like to read this book forward and then have the kids help On the night before Tim’s birthday he finds a strange and secret message full of cryptic shapes. The message tells him to follow the directions in the letter to find his birthday present. Each of the successive pages features a line of the message that takes Tim closer to his present. Carle uses his signature illustration style along with layered pages to create an intriguing mystery. The final page shows a map of the route Tim takes. I like to read this book forward and then have the kids help me reverse the trip so that Tim gets back home. Eric Carle (born June 25, 1929) is a children's book author and illustrator, most famous for his book The Very Hungry Caterpillar, which has been translated into over 30 languages. Since The Very Hungry Caterpillar was published in 1969, Eric Carle has illustrated more than seventy books, many best sellers, most of which he also wrote, and more than 71 million copies of his books have sold around Eric Carle (born June 25, 1929) is a children's book author and illustrator, most famous for his book The Very Hungry Caterpillar, which has been translated into over 30 languages. Since The Very Hungry Caterpillar was published in 1969, Eric Carle has illustrated more than seventy books, many best sellers, most of which he also wrote, and more than 71 million copies of his books have sold around the world.